Like St. Luke’s Place a block to the south, quiet winding Morton Street attracted well-to-do merchant class families by the late 1840s. The street where Federal style homes of a generation earlier still stood saw the construction of wide brownstone or brick-faced homes in the latest Greek Revival style. A year after Nos. 60 and 62 Morton Street were built for clothing merchant John D. Scott and lumber dealer Helmus H. Wells, a near-matching house was completed at No. 58. Construction on James H. Noe’s house began in 1848 and was finished a year later. Noe was a highly-successful brush maker with a store and factory downtown at No. 275 Greenwich Street. Like its twin neighbors, No. 58 sat on a rusticated brownstone base. Floor-to-ceiling windows graced the parlor level where the brownstone entrance was ornamented with elaborate foliate capitals. Exquisite capitals take the shape of fanning ferns. It appears that Noe and his wife, the former Katherine Mangels, lived in the Morton Street house for a little over a decade, after which they moved to No. 21 King Street. Later James H. Noe would be the victim of one of the most publicized murders of 19th century New York. Among the criminals that populated the gritty Five Points neighborhood was Johnny Dolan. Dolan was well-known to police as a street brawler, burglar and gangster. Dubbed Dandy Johnny, he was the Beau Brummel of Five Points—wearing expensive shoes and clothes, carrying carved canes and oiling his hair. In the summer of 1875 James H. Noe, now 50 years old, was in the process of expanding his factory. A new building was being constructed next door at No. 277 Greenwich Street and on Sunday morning August 22, he entered the building to check on its progress. When he climbed to the roof he came upon Johnny Dolan in the process of stealing the lead from the gutters. A fight ensued during which Noe, reportedly a large man, dragged the crook down the stairs; but Dolan picked up an iron pry bar and struck Noe several times on the skull. James Noe died of his injuries several days later. In the meantime, Talins Wells had moved into the house on Morton Street. Two years after the beginning of the Civil War, the draft was initiated—a lottery which would change Talins Wells’ life. Police were on hand to keep order. The newspaper said that “Upon a central table is placed the wheel of destiny.” Commissioner Lamont spun the wheel, Conklin Bishop (chosen apparently because he was blind) drew the names, and Samuel F. Sleight read the names—1,100 in all that first day. Among the names called was Talins Wells. He was among fifteen other Morton Street residents inducted that day, including two brothers each from Nos. 21 and 84. Wells eventually became Chief Bugler for the 6th New-York Cavalry—a distinctive and highly dangerous position. In October 1867 news reached the Wells family on Morton Street that he had distinguished himself by capturing the Flag of the 14th Georgia Infantry. Following Wells, the house became the property of John Moller. After his death it was leased from the estate by John J. McNulty. He lived here with his wife Mary, and their daughter who taught Latin. McNulty had graduated from City College in 1881 and in 1890 while living here the 27-year old was appointed “tutor in philosophy” at his alma mater. About five years later, having earned his doctorate, he was made head of the Philosophy Department. Having lived at No. 58 Morton Street for over a decade, John McNulty purchased it on December 29, 1902 for $14,900 (approximately $225,000 today). Six years later, on May 1, 1908 John and Mary left the house early in the afternoon to go shopping. The couple visited several stores together and then went their separate ways when John headed to Macy’s while Mary went further uptown to a dressmaker’s. After buying a few things downstairs, McNulty took the elevator to the 5th Floor grocery department. Dr. A. W. Allison and a woman were also passengers in the elevator. After getting off the elevator and taking a few steps, Allison heard a man’s scream. Rushing back he saw the elevator gate was open and, looking down, saw Professor McNulty’s body at the base of the shaft. In the meantime Mary McNulty had finished her shopping and returned to No. 58 Morton Street. Delivery wagons came and went, dropping of bundles that she and her husband had purchased; but there was no sign of John. Finally, around 7:00, there was a knock at the door and she was informed of the accident. Three days later, on Monday morning May 4, John McNulty's funeral took place in the Morton Street house. In 1912 the house was home to Isaac Rice, a court clerk, but by the 1940s it was an unofficial apartment house with one spacious apartment per floor. It was during this time that No. 58 along with other buildings on the block would begin being home to artists and celebrities. By now the stately brownstone stoop had been removed to provide an entrance at street level. The original doorway was creatively converted to a many-paned window and, thankfully, the wonderful entrance enframement was left intact. A 1940 Tax Record photograph shows the house without its stoop. Fortunately, most of the architectural detailing was preserved. Artist Ben-Zion and his wife lived on the second floor. Reportedly the couple stuffed the space with sculpture, paintings, ceramics and other art objects and artifacts collected throughout the years. Before long the newly-single Elliott Gould would move in. The actor had divorced Barbra Streisand in 1971 and lived here with the 19-year old Jennifer Bogard, daughter of Hollywood director Paul Bogard. Next door at No. 60 John Belushi was living. Around the same time poet William Bronk shared an apartment here with Al Pew for a year. Victorian ladies who made purchases in Sixth Avenue’s grand emporiums that made up what was known as the Ladies’ Mile did not expect to wrestle their packages home. Among the many services provided by the high-end stores was free delivery. Purchases were wrapped and bundled to be sped to their destinations in attractively-painted delivery wagons; often arriving there before the lady of the house returned. By 1896 bachelor merchant Benjamin Altman was one of the main players on Sixth Avenue. His massive B. Altman dry goods store which stretched from 18th to 19th Street catered to the carriage trade, offering gowns from Worth and Pingat of Paris and bonnets from Madame Eugenie’s and Virot’s. Nine years earlier Altman had doubled the size of his store and added modern conveniences like elevators and electric lights. The increased business meant increased deliveries and, therefore, a larger stable was needed. Down the block at Nos. 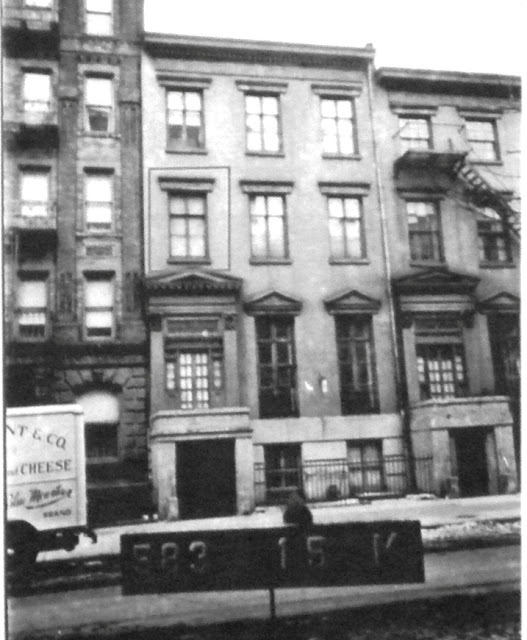 135 through 143 West 18th Street stood the old Germania Brewery and a one-story brick stable building. In 1893 the brewery had failed and in a foreclosure sale that year the vacant four-story brick building along with the abutting stable was sold for $93,498. The architects were simultaneously given the task of producing a new stable for the company on the site of the existing brewery and stable. This would be no run-of-the-mill stable building. The machinery to run the department store was built into the basement level of the stable. 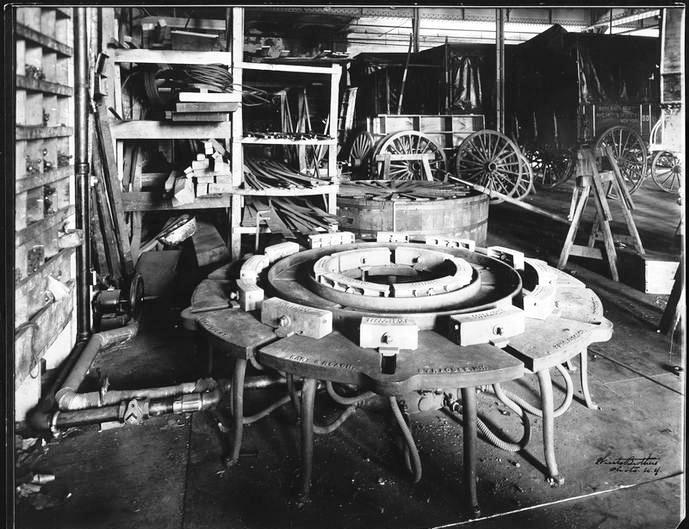 “There will be boilers of combined capacity of from 1,000 to 1,200 horse power, a number of dynamos for the lighting of the building, which will aggregate at least 6,000 sixteen-candle-power lamps; also the pumps and tanks for elevators and other necessary machinery, so that the basement of the store will be free for the handling of goods and the convenience of employes,” said The Times. The architects’ plans to house all the machinery in the stable building rather than the store itself eliminated the possibility of fire that would endanger customers and expensive goods. The completed stable was, to say the least, impressive. Faced in granite and limestone, the Renaissance Revival structure stretched 125 feet wide and rose five stories with two decorative corner towers. The two central bay doors were mimicked by flanking window openings. The sturdy design, while undeniably utilitarian, was at the same time dignified and handsome. Inside the building was a hive of activity as grooms cared for the teams of horses, leading them up and down interior ramps, feeding and watering them and tending to their well-being. Dozens of drays were maintained, axles greased and damaged parts replaced. Boys rushed back and forth with packages to be packed onto the delivery vehicles and shipped out to all parts of the city. One can imagine a scene of well-orchestrated chaos. Six years later, in 1902, Roland Macy pushed over the first domino that would eventually result in the end of the Ladies’ Mile. He moved his department store from 6th Avenue and 14th Street to 34th Street, startlingly far north of the retail district. By this daring move he started the northward trend of department stores and Benjamin Altman would be the first to follow suit. 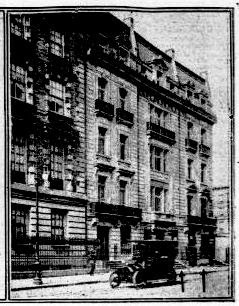 On December 11, 1904 The Sun reported that Altman intended to build “an enormous store” on Fifth Avenue, diagonally across from the exclusive Waldorf-Astoria Hotel. But one Sixth Avenue retailer was unwilling to accept the tide of change. Civil War hero Joseph B. Greenhut had joined the management of the immense Siegel-Cooper store across the avenue from Altman’s in 1896. In 1902 he and his son Richard took control by buying out Henry Siegel. As rumors of the impending death of the Ladies’ Mile increased, so did Greenhut’s conviction to keep the district alive. On April 21, 1906 Greenhut, with Henry Morgenthau, purchased the 88,000-square foot Altman store for $2.5 million. “Included in the deal also is the new granite-front stable in Eighteenth Street,” reported The Times. A little over a year later the old Altman store was nearly ready for opening under Greenhut’s management. In August 1907 more than 400 workmen were busy updating and renovating the building. Greenhut focused especially on the package delivery to draw new customers. Three years later, on March 9, 1910, the New-York Tribune announced that the store had hired architect G. W. Springsted to remodel and improve the stable building at a cost of $10,000. Greenhut’s faith in the Ladies’ Mile, despite the great expenses he poured into his buildings, eventually proved futile. In 1914 the Siegel store failed, followed by the Greenhut company a year later. The bankruptcy documents assessed the stable building at $124,741—about $2 million today. The stable building was purchased by Philadelphia-based William R. Warner & Co. On December 9, 1916 The American Contractor noted that architects Buchman & Fox had been hired to renovate the old structure at a cost of $125,000. The Ladie’s Mile along Sixth Avenue and the adjoining blocks suffered hard times through most of the 20th century. The old B. Altman stables became loft space for small factories, offices and workshops. In 1996, while the avenue was experiencing a rebirth and the grand old emporiums were being renovated and restored, the lower floors of No. 135-143 West 18th were used as a factory while commercial offices took up the higher floors. Then in 1998 the building was renamed the Altman Building with 15,000 square feet of the cavernous structure revamped into an event space. Renovated office space on the higher floors attracted new-age tenants like Eyeblaster, a provider of digital marketing services and technology. The building that once bustled with teams of horses, deliverymen, and gowns from Paris packaged in paper-wrapped boxes survives today with, at least on the exterior, little change. Around 1825, as Greenwich Village experienced a building and population boom, Trinity Church began developing the land into building lots. 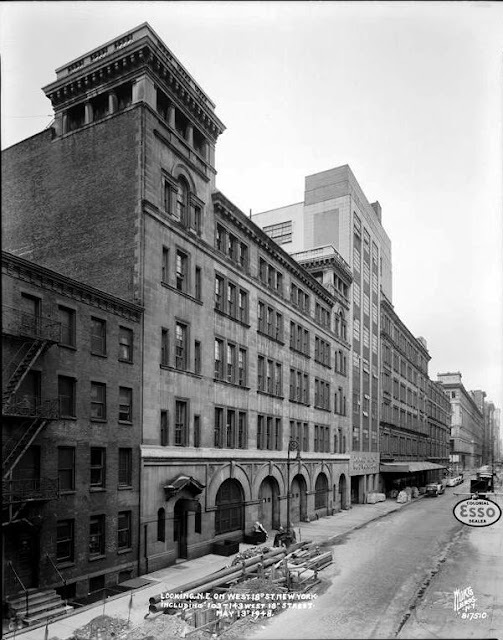 Local builders George and David Sutton leased the southern half of the Hudson Street block, on the western side, between Barrow and Morton Streets and began building. In 1826 No. 447 at the corner of Morton Street was completed as George Sutton’s own home. David Sutton’s house would rise at the opposite end of their property, at No. 453. Between the two, No. 449-1/2 was built in 1827 and No. 451 was completed in 1828. Like its neighbor, No. 451 was a quaint brick-fronted Federal–style house. It rose two and a half stories with prim dormers above the cornice. Before long, No. 451 received a make-over when the attic was raised to a full story. The now-popular Greek Revival style showed its influence in a sizeable fascia board below the cornice with small windows cut into it. Before the decade was over, the upper floors were rented out to various families. In 1865 George Steinrick was living here when he was drafted into the Civil War. The Bishnisky family was also living here at the time, including 12-year old Solomon. Young Solomon was playing at the foot of the nearby Christopher Street pier on July 4, 1866. The boy lost his footing and fell into the Hudson River (called at the time the North River) and was drowned. The body was recovered and brought back to No. 451 Hudson Street. The following day an inquest was held in the house by Coroner Wildey who ruled the death accidental. Upstairs tenants and downstairs businesses came and went throughout the remainder of the century. Walter Scott, a member of Company 1 of the 9th Regiment, was living here in 1883, and six years later the Triumph Rupture Cure moved in at street level. Where Nathaniel Binns had manufactured silk and straw bonnets, Dr. C. A. M. Burnham, physician and surgeon, and truss expert J. A. O’Connor installed the National Truss Rooms. The doorway sits within a recessed, paneled entrance. While Dr. Burham and Mr. O’Connor consulted on ruptures, Mrs. Murray, the mother of Policeman Henry Murray of the Prince Street Station, was running the boarding house upstairs. At the same time the Vacquerie family was rooming nearby at No. 15 Carmine Street. Mr. Vacquerie was an artificial flower maker who died suddenly in 1892, leaving his 29-year old widow to fend for herself and their 7 year-old son, Harry. A concerned neighbor reported the case to the Gerry Society—a private group somewhat equivalent to today’s Child Protective Services—and both Harriett and her son were taken to the Jefferson Market Police Court. Little Harry was committed to the Society’s care and Harriet was sent to Bellevue Hospital for psychological evaluation. The Sun reported that “The doctors at Bellevue could find nothing wrong about Mrs. Vacquerie, and she was discharged.” A friend, Mr. Outten, contacted Mrs. Murray at No. 451 Hudson Street and asked if she could keep Harriett Vacquerie for a few days. On Saturday, May 20, “Mrs. Murray gave up her front parlor and Mr. Outten brought the poor woman from Bellevue,” reported The Evening World. Then around 1 a.m. on Tuesday, May 23, Mrs. Murray heard the sound of a window opening and found Harriett Vacquerie sitting on the sill with her feet hanging out. With the help of other boarders she got the woman back to bed and she dragged her own bed next to Harriett’s so she could keep an eye on her. The loud crash and Harriett’s screams awoke not only the other boarders, but the neighbors. When police arrived they found the 30-year old woman seriously injured. Described by The Evening World as “partly crazed by worriment, overwork and dire poverty,” she had broken both legs and suffered internal injuries. By 1902 the ground floor was home to a shoemaker shop owned by the father of little 5-year old Sarah Gelber. On the opposite side of Hudson Street was Nicholas’s Candy Store and just before noon on May 4 a group of neighborhood children gathered in the shoe shop. In a kindly gesture, the shoemaker gave Sarah some money to purchase chocolates for her friends and the little girl darted across the roadway. As the five-year old headed across the street, a street car turned the corner coming north. The motorman saw her, but she was moving quickly enough that he knew there was no danger of hitting her. But then she stopped to rub her eyes. When the fender of the street car hit little Sarah a woman on the sidewalk screamed, attracting the attention of everyone around. As the passersby watched, Sarah “flew high up into the air and landed in a sitting posture on the fender. She had stuck to the candy because the candy had stuck to her,” reported The Times. Little Sarah sat fast on the fender of the street car until it finally came to a stop at the corner of Barrow Street, nearly a full block away. A crowd of nearly fifty people crushed around the girl, including her sixteen year-old sister, Freda Gelber, who was unable to get near. The building continued its life as a boarding house for the next few decades. By 1930 Alban Baumann was running his antique shop on the ground level. Baumann became part of the investigation and trial regarding the murder of a Greenwich Village girl, Starr Faithfull in 1931. The partially clad body had been found in June that year, the same month that her step-father, Stanley Faithful, had placed an antique Empire sideboard in Baumann’s shop. Alban Baumann was called before the grand jury to testify about the family antiques he had seen in their $85-a-month apartment at No. 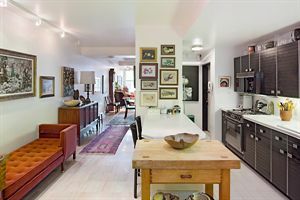 35 West 9th Street, including a Chippendale chest and two Duncan Phyfe chairs—antiques which belonged to Stanley Faithful’s wife’s family, not his. It appeared that the Faithfulls were in financial straits and Stanley was furiously trying to raise cash by disposing of his wife’s heirlooms. In 1972 the house was converted to four apartments including a triplex and a duplex. The commercial floor and storefront were eliminated and the exterior restored to its residential appearance. Vincent J. Tapick, president and owner o Joseph H. Carter, Inc. a wholesale fish distributor at the Fulton Fish Market, lived in the house in 1997. A scar in the restored brickwork reveals the former arched opening to the first floor commercial space. On March 5 that year agents from the national Marine Fisheries Service of the US Department of Commerce arrived at Tapick’s office with a search warrant. The agents intended to search for records of any violations including netting too many ground fish (such as haddock), or fishing in protected areas. Instead they found guns. Tapick and a vice president, Warren D. Kremin, were arrested on weapons possession when two loaded handguns were found in their desk drawers. The house was renovated once again, in 2006, this time to three spacious apartments. Nearly two centuries after its construction it serves as a snapshot of Hudson Street in the decades just before the Civil War. By the 1880s the area around the Washington Market was home to New York’s wholesale and retail food dealers. The district now known as Tribeca filled with brick loft and store structures, often built for the prevalent dairy and produce businesses centered here – the “egg and butter” trade. In 1867 a handsome five-story structure was completed at No. 73 Hudson Street. Four floors of red brick sat upon a cast iron base with fluted Corinthian columns. Thirteen years later developer David Martin hired Amzi Hill to design a loft building next door at No. 71. The architect’s job was simple: reproduce No. 73. Like its next door neighbor, the new Italianate-style building stretched through the block to Staples Street. The cornices, stringcourses and openings lined up so perfectly that the passerby, in 1880 or today, would hardly suspect the two buildings were not built simultaneously as a pair. Five years after construction, the building was purchased by merchant William T. Coleman. Coleman had fronted the funds to established William T. Coleman & Co. on New Year’s Eve 1883. His year-old firm now had its own building. That same year William T. Coleman & Co. was sued by the Bank of British North America for $25,000; a problem that may have contributed to Coleman’s selling No. 71 Hudson Street. Prior to the Civil War in Wolcottville, Connecticut, Gail Borden established a small factory to produce his invention—condensed milk. In 1858 Jeremiah Milbank financially backed his operation and the New York Condensed Milk Company was formed. The once-tiny operation, boosted by the convenience of condensed milk during the war, was a thriving business in 1889. The company purchased No. 71 Hudson Street as a milk warehouse for its product and that of its related company, the Borden Condensed Milk Company. In the last years of the 19th century Flemish Revival-style structures began dotting Manhattan—a nod to the city’s Dutch roots. The New York Condensed Milk Company joined the trend when it commissioned Dehli, Chamberlin & Howard to add two stories to the building in 1896. The architects transformed the Italianate structure to a Flemish one by the addition of a curving two-story gable. The brick façade was painted a light color, as was No. 73, and decorative iron masonry supports were added to update the design. An early photograph shows wide panels, stretching the width of the structure, affixed below the third, fourth and fifth floors. At the same time the company supplied the United States Navy with condensed milk—a lucrative contract that would last several years. Also in the building in 1905 were the James M. Bell Company, wine importers, and F. O. Boyd & Co., dealers in California wines. Gustave F. Speckel and his 28-year old son, Henry George Speckel, were involved with both companies; Gustave being vice-president of James M. Bell and Henry being secretary. Things seemed to be going well for Henry Speckel. He was married in August 1905 and he was earning an enviable salary. But in November he contracted typhoid fever, a condition that threw him into depression. At 4:45 on the evening of November 20 Mrs. Speckel noticed her husband’s overcoat and black derby were missing from the hallway rack. Concerned, she telephone her father-in-law and after a visit to several neighboring houses, Speckel notified the police. Mrs. Speckel said her husband was “in a disturbed condition of mind,” and described his dark suit and tan shoes. He had, she said, no money when he left home. Six days later Gustave Speckel offered a $250 reward for information leading to the discovery of his son. But despite earnest attempts the young man could not be found--until May 8 the following year. By the 1930s the building was owned by the Carnation Milk Products Company, which occupied the upper floors. The Mohawk Condensed Milk Company took up the first three floors. The building was the scene in 1931 of a disastrous three alarm fire. For two hours on August 21 firemen battled the fire. NYFD Captain Augustine O’Connor of Hook and Ladder Company No. 1 suffered what The New York Times called “an apoplectic stroke” while directing his men. He “was removed to Beekman Street Hospital where it was reported that he was paralyzed from the waist down and unable to speak.” Two other firemen were slightly injured in fighting the blaze. In 1937 Joseph J. Herold, Jr., purchased the building from the Carnation Company for just $23,000—less than half of what it had cost to repair the damages from the fire six years earlier. As the 20th century drew to a close, the Tribeca area changed from one of warehouses and small factories to a trendy neighborhood of upscale restaurants and luxury apartments. In 1984 No. 71 Hudson Street was converted to “loft dwellings,” one enormous residence per floor. In was here, in August 1989, that John F. Kennedy, Jr., lived in a sub-leased apartment. Although the Flemish gable has been slightly decapitated, the rest of No. 71 is astoundingly intact—right down to the original cast iron base. The 1896 renovation that took the building from handsome to picturesque still makes it a standout on an architecturally-interesting block. At the turn of the last century Madison Avenue rivaled Fifth Avenue as the prestigious residential address. 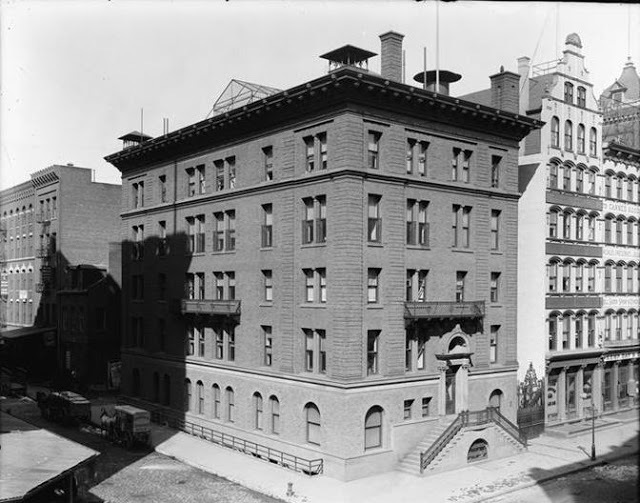 Millionaires like Stuyvesant Fish, Gertrude Rhinelander Waldo and Henry Marquand erected massive stone mansions on Madison Avenue, establishing the thoroughfare as a highly enviable address. In 1902 speculative developer Jeremiah C. Lyons began work on three harmonious residences at Nos. 1014 to 1018 Madison Avenue, adjoining the Fish mansion. The architectural firm of York & Sawyer designed the houses to appear as a single, grand French palace. The five-story Beaux Arts style residences were completed a year later, creating an elegant and imposing presence on the block. No. 1016, the central mansion, was perhaps the most eye-catching, with its expansive centered windows rising three stories. Despite the exclusive location and the quality of the mansions, Lyons had difficulty selling Nos. 1018 and 1016; and the advent of the Financial Panic of 1907 did not help. On February 8, 1910, seven years after the homes were completed, The Sun reported that the two properties were to be sold in foreclosure. The auction took place the following month and on March 20, 1910 the sale of the two handsome structures was announced in the New-York Tribune. No. 1016 was purchased by Philadelphia art collector and explorer Thomas Cardeza. It would seem that Cardeza purchased the property as an investment, for he never lived in the house; choosing instead to lease it. The 34-year old son of wealthy heiress Charlotte Drake Cardeza apparently preferred the gentleman’s lifestyle to being grounded to a regular job. In March of 1912 he was staying in a hunting lodge in Hungary when he headed back to the United States to receive medical treatment. He met his mother in Cherbourg, France and on Wednesday, April 10 they boarded the new ocean steamer, the R. M. S. Titanic. Mrs. Cardeza needed the expansive suite, for she boarded the liner with fourteen trunks, three packing crates and four suitcases. Reportedly Thomas Cardeza spent much of the voyage playing poker. 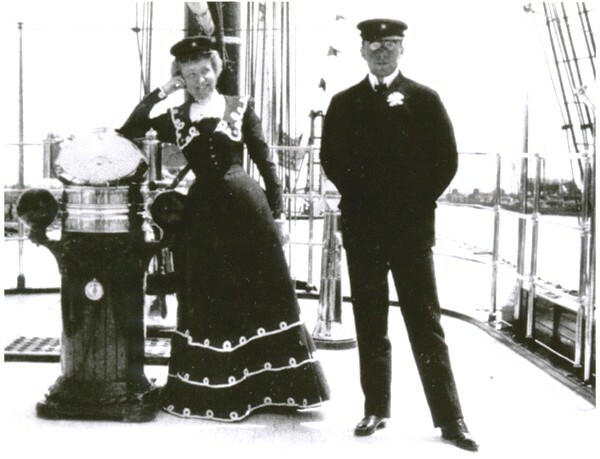 Along for the voyage were Cardeza’s manservant, Gustave Lesueur, and Charlotte Cardeza’s maid, Annie Moore Ward. Four days after boarding, on April 14, the Titanic famously struck an iceberg. All four of the Cardeza party managed to board Lifeboat No. 3 and survived the disaster. Within the year Cardeza sold the house at No. 1016 Madison Avenue to Henry Ingersoll Riker. The 41-year old New York City native had received his law degree from Harvard and was admitted to the bar in 1894. But three years later he left the legal profession to join the banking firm of Redmond, Kerr & Company. After serving in the Spanish-American War as a member of Troop A, New York Cavalry and then in Puerto Rico, he married his cousin May Riker, in 1903. By then he was the head of his own brokerage firm at No. 74 Pine Street. Henry and Mary moved in to No. 1016 with their three children, John Lawrence, age 9; and twins Henry and Mary, age 5. The Rikers would remain in the house until 1926 when it was sold to Francis H. Lenygon. The English-born Lenygon was a world-renowned authority on period interiors and furniture. He had arrived in New York in 1910 to decorate the mansion of Whitelaw Reid. One commission followed another and he finally established a branch of his London firm Lenygon & Morant, Inc. in New York. After purchasing No. 1016, Lenygon moved his business from No. 16 East 60th Street. He lived in the upper floors without actually converting the house to a dual-purpose structure. Lenygon & Morant was responsible for the interior decoration of the homes of Harry F. Guggenheim, Colonel M. R. Guggenheim, Percy R. Pyne, Guy Fairfax Cary and other millionaires. When John D. Rockefeller, Jr. and his wife Abby Aldrich Rockefeller became involved in the rescue and restoration of Williamsburg, Virginia they searched for a leading expert in English 17th and 18th century interiors. They chose Francis Lenygon. Lenygon served as consultant on the restoration and traveled to England to choose the furnishings for the Governor’s palace. The same year that Lenygon purchased No. 1016 Madison, he married Jeannette Becker. The couple lived together in the house for nearly two decades. Then, in 1943, the 66-year old Lenygon’s health failed and he died in the house on Saturday evening, June 12. The mansion became home to the Perls Galleries in 1954. Run by Klaus G. Perls and his wife Amelia (better known as Dolly), the gallery originally sold works by European artists like Utrillo, Maurice de Vlaminck and Raoul Dufy. The Perls branched into modern American art and the same year that they moved into No. 1016 they began representing Alexander Calder. During the 1960s and ‘70s Calder boarded in the house and the artist designed the stone walkway that serves as the sidewalk in front of the three York & Sawyer mansions. By the 1990s the aging couple began donating important collections to museums. In 1991 they gave 153 pieces of African royal art to the Michael C. Rockefeller Wing of the Metropolitan Museum of Art—carved ivory tusks, musical instruments, bronze figures, jewelry and decorative masks among them. Four years later they gave the Metropolitan Museum thirteen important works—the largest donation ever received to date by its department of 20th century art—including works by Pascin, Picasso, Braque, Modigliani, Leger and Soutine. 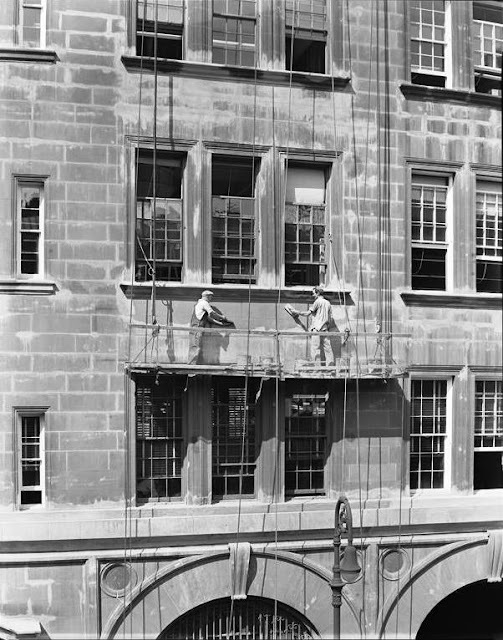 The Perl Galleries remained in the Madison Avenue mansion for forty-three years, closing its doors in 1997. The Arader Gallery moved into the house shortly afterward, continuing the tradition of upscale art. The house has still not been structurally divided. The remarkable mansion was put on the market a few years ago for a jaw-dropping $75 million. In the 1630s, in the countryside far north of New Amsterdam, a rushing stream emptied into the East River. Over two centuries later it would run below East 74th Street; but for now it caught the eye of Dutch settlers who used the water to power a sawmill. With no wagon roads on which to transport the finished lumber it was sailed down the river to New Amsterdam. The stream earned the name Saw Kill, or Saw River, and in 1677 the mill was acquired by George Elphinstone and Abraham Shotwell who converted it for leather manufacturing. Later the land became the property of Alderman Cox who developed it into a farm with a summer house. Upon his death the property passed to his wife, Sarah Bradley Cox, who eventually married the notorious pirate, Captain William Kidd. Captain Kidd had a city house on Pearl Street; but used the Saw Kill farmhouse for several summers. On his way back to New York on July 6, 1699, Kidd was arrested in Boston. A year later he was hanged in London for piracy and murder. Sarah Bradley Cox Kidd and the Captain’s daughter lived on in the farm until Sarah married Christopher Rousby in 1703. The house and farm changed hands rapidly. Rousby passed the farm to John Gurney, a New York banker, who soon died. His widow, Mary, sold it on September 23, 1708 to Thomas Hook, Jr. “gentleman” of New York for 400 pounds. Hook would own the farm until 1730 when he sold it to John Devoor. 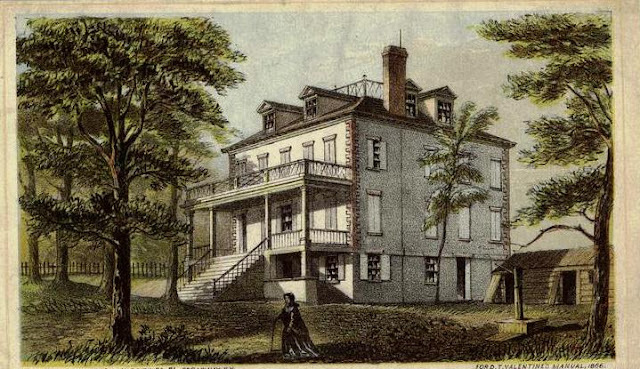 Devoor lived in the house for half a century, during which time upper Manhattan saw the appearance of vast summer estates of New York’s aristocracy, side-by-side with working Dutch farms. By the end of the century the property was owned by David Dickson and Andrew Stockholm. They constructed expansive cotton mills on the Saw Kill here in 1791 and brought in experienced workmen from Manchester, England. The ambitious project failed. Isaac Gouverneur took over the land on December 26, 1799; but he too ran into financial difficulties. On March 6, 1806 the property was sold at $30,000 in foreclosure to three brothers-in-law—Richard Riker, John Lawrence and John Tom. A year later John Tom was dead and Riker and Lawrence divided the large farm in halves. Lawrence renovated the old Sawmill Kill farmhouse on his section and in 1811 Richard Riker built “a fine stone dwelling,” as described by historian James Riker in 1881, on his land. Riker’s primary residence was on Fulton Street between Broadway and Nassau Street. He had been Deputy Attorney-general of the State of New York, and afterward a Supreme Court Commissioner. In 1815 he was appointed Recorder of the City. Although historian Charles Haynes would later recall that “He was universally respected as a clear-headed and upright judge,” his stern approach was noticed. “In sentencing culprits he was apt to remark, they ‘must suffer some,’ and the frequent repetition of this was taken up by the people and it became a byword,” said Haynes. The landscaped lawn sloped gently to the riverbank. 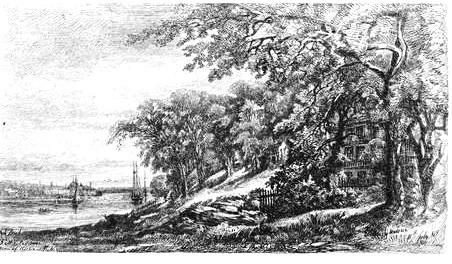 In her 1875 book “Old New York, from the Battery to Bloomingdale,” Matilda Pratt Despard noted that “A brook ran through the grounds, and wound its way through the lawn to the river; and after he had built his house, Mr. Riker, in order to make a wide slope of unbroken lawn, threw over this brook an arch of solid masonry.” The distinctive stone arch over the stream lent its name to the house: Arch-Brook. The Riker family summered for years at Arch-Brook and it was here that son John H. Riker was born in 1818. 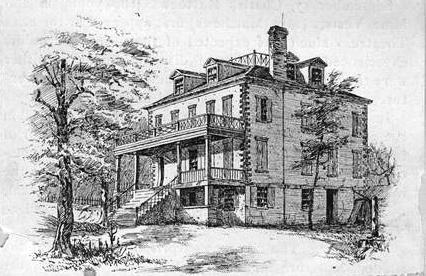 Riker’s elevated position as Recorder brought him into contact with celebrated figures of the time and the mansion was the scene of elegant entertainments. As the city grew, sanitation and safe drinking water became a problem. In 1832 cholera broke out and between July 24 and October 1 about 3,500 residents died. Discussion arose about the possibility of bringing drinking water from the Croton River upstate. 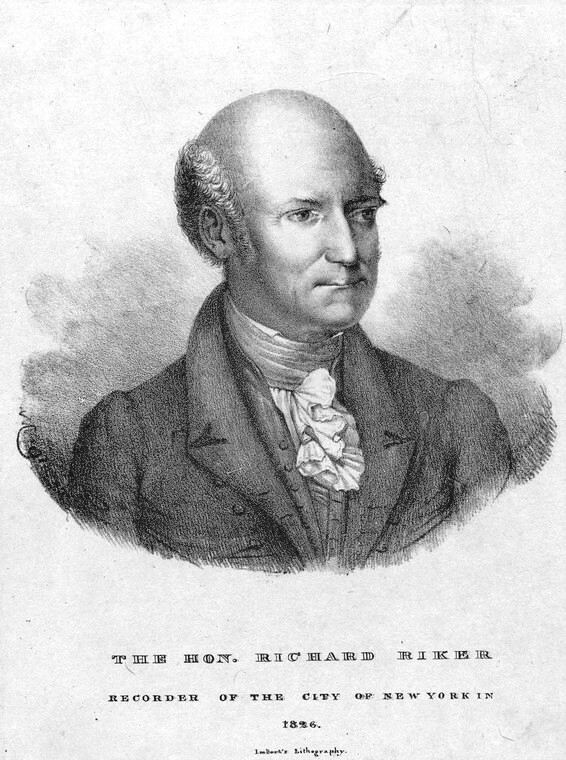 On October 16, 1842, Richard Riker died at Arch-Brooke at the age of 69, the same year that the massive Croton Reservoir he had railed against was completed. By not the city was rapidly approaching, replacing the farms and estates north of 14th Street with streets and avenues. The Riker family divided the estate into city lots; however Arch-Brook was preserved. It sat within the city block of 74th and 75th Streets, between Avenues A and B and a stone wall was built to protect it. Arch-Brook became the home of John Matthews who had made a fortune in the soda water business. As a young man in the 1830s he perfected the art of carbonating. His simple equipment included a cast iron box lined with lead in which carbonic acid gas was generated by the interaction of marble chips with sulfuric acid. The gas was passed through a tank of cool water which he rhythmically rocked. When the monumental white marble St. Patrick’s Cathedral was begun, he negotiated the purchase of all the marble chips. It was estimated that by the time the cathedral was completed its chips had produced 25 million gallons of soda water. As the city grew around it, the Matthews family lived on in Arch-Brook tended to by a staff of servants. Along with the immediate family in 1883 was 24-year old Frederick Matthews, a nephew of John and a member of the firm. By now the company was “one of the first and wealthiest of its kind in the country,” as reported in The New York Times. Young Frederick had much to live for that summer. He was engaged to be married in July and his uncle had “specially fitted up” the family country estate in the Adirondacks for the newlyweds to spend their honeymoon. On July 25 he returned home from work “in excellent spirits,” according to his cousin Emily. Around 2:00 in the morning Emily was awakened by “a noise as if a shutter had been blown against the house.” She got up and listened at her aunt’s door and, hearing nothing, went back to bed. Frederick had asked a servant to arouse him at 7:00 for breakfast because he had an appointment with a real estate broker regarding property to buy. When he did not come down by 8:00 Emily went up to check on him. Frederick’s fiancée, Miss Field, was summoned “by a dispatch informing her that her affianced was very ill.” As she alighted from her carriage, she noticed the undertaker’s wagpn on the ground of Arch-Brook. The Times explained the unpredictable tragedy saying “All the circumstances surrounding the suicide tend to show that the unfortunate young man had become suddenly insane during the night,” and added “The taint of suicidal insanity seems to have been inherited by young Matthews.” The newspaper then rehashed the suicide four years earlier of Frederick’s father who had been despondent over the death of his brother for days. Joy returned to the house the following year when George Matthews Jr., Elizabeth Matthews’ grandson, was married to Grace Birmingham in the house on October 29. Times would, eventually, catch up with the former Riker estates. While Elizabeth Matthews was seeking a new cook, the Manhattan Elevated Railroad company held a monopoly over the city’s growing elevated transportation system. As the operation expanded, additional electric power was needed. The bank of the East River at 75th Street was ideal for a power plant, as it had been in 1630s (albeit it on a much smaller scale). 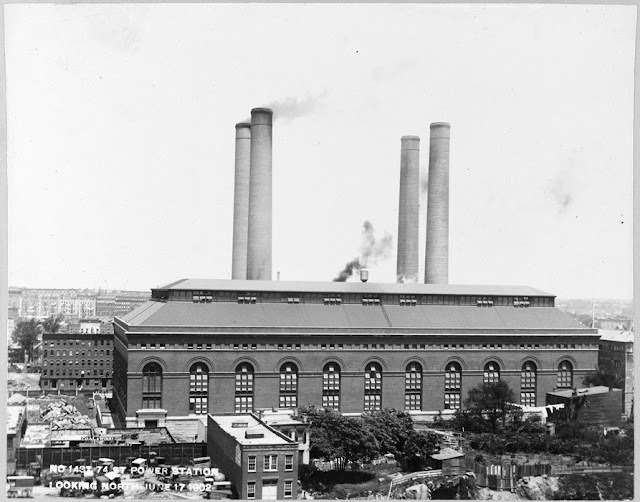 The massive Manhattan Elevated Railroad powerhouse was completed in 1903, erasing an especially gentile page of Manhattan history. The 1894 House of Relief -- Nos. 67-69 Hudson St.